SCOTTSBORO, Ala., July 31, 2012 In order to offer a higher level of customer service, the Unclaimed Baggage Center, the Lost Luggage Capital of the World, will be partnering with iCapture and Archelon Enclosures to provide point-of-sale interaction with customers. In only the first month, this technology has already increased customer engagement by nearly 300%. The emails and mobile phone numbers captured are vital in continuing the relationship with a customer after they leave the store. 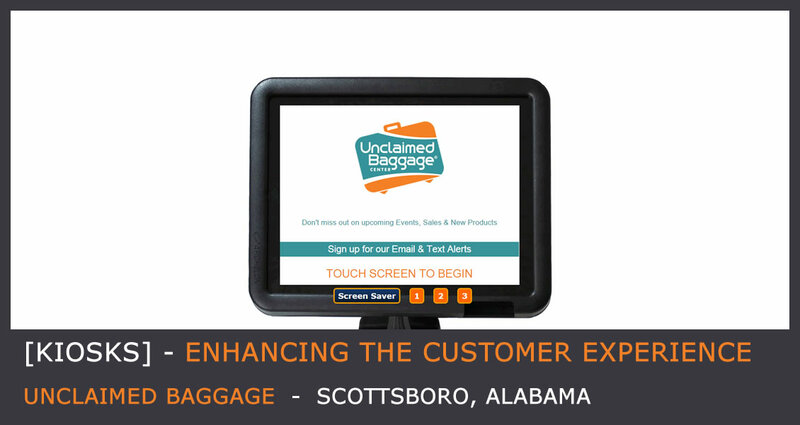 “By capturing information at the cash register, we are giving our customers and fans the ability to be on the inside tract giving them priority access to products and events at Unclaimed Baggage Center,” said Brenda Cantrell, Brand Ambassador for Unclaimed Baggage. “We are proud to offer the latest in consumer engagement technology to Unclaimed Baggage as they continue to develop relationships with local customers. Unclaimed Baggage has customers that visit the store from around the country and around the world,” said Brady Roberts, President and CEO at iCapture.com. The iPad app and software program by iCapture provides a simple, quick and effective way for the customer to enter their information on an iPad. The information is then automatically delivered by iCapture to the CRM software utilized by Unclaimed Baggage Center. Archelon Enclosures provides industry-leading tablet and iPad enclosure and mounting designs that ensure total security, protection and durability with a sleek contour that preserves the tablet experience. “Unclaimed Baggage offers customers a unique experience through their warehouse of unclaimed items. This product fits in with their culture, by providing a unique way to continue a relationship with a customer,” said Debi Besmer, Managing Partner of Archelon Enclosures. About Unclaimed Baggage: The Unclaimed Baggage Center is a 40,000-square-foot retail store. One million people from almost every state and over 40 million foreign countries visit the store annually to treasure hunt for unique items. The unique products are acquired by purchasing unclaimed luggage after airlines have conducted an extensive 90-day search to reunite the original owner with his or her bag. Of the billion or so passenger bags checked every year, only one half of one percent fails to meet up with their owners at the claim carousel and only a small fraction of this one percent are never reunited with their owners. Unclaimed Baggage partners with charities to reclaim for good items that were lost, including clothing, medical supplies, eye glasses and wheel chairs. For more information about UBC, please visit http://www.unclaimedbaggage.com or follow the store on Facebook , YouTube, Pinterest or Twitter. About Archelon Enclosures: Archelon Enclosures is a Division of Motivational Systems, Inc. Headquartered in San Diego, Calif., Motivational Systems, provides graphic and interior design services, complete sign systems, and custom interior displays and furnishings to residential and commercial builders and developers. Our sales and information centers, sign programs, graphic design and architectural models are consistently honored with local, regional and national awards. MSI is dedicated to being a contributing member of the communities in which they do business and provides an environment of opportunity for both client and employee to exceed their highest expectations. Motivational Systems was established in 1975. About iCapture: iCapture + iPad = The Data You Need. iCapture’s proprietary data collection systems and loyalty programs empower businesses around the world to engage with customers and prospects like never before. Utilizing cloud-based data management, iCapture has leveled the playing field, allowing those without massive IT infrastructures to compete on a much higher level while developing closer, more responsive relationships with individual customers. The iCapture suite of applications puts the power of customer interaction at your fingertips. Just as smartphones and the iPad have revolutionized computing, iCapture strives to put these new technologies to use in your business. iCapture.com is headquartered in Boise, Idaho. For more information visit: http://www.iCapture.com.